Spirit AeroSystems is a major supplier for the new Cessna Citation Columbus jet. Cessna had more than 70 orders for the new $27-million jet as of early October. pirit AeroSystems, the world's largest supplier of commercial airplane systems and components, is also one of the industry's most actively expanding companies, with major projects under way or recently completed on three continents. Spirit, which formed when Boeing Commercial Airplanes sold its Wichita division to private equity investment firm Onex in 2005, has a big-name customer list that includes Airbus, Boeing, Cessna, Gulfstream, and Hawker Beechcraft. Spirit specializes in manufacturing composites, fuselages, pylons (which hold the engine to the wing), nacelles (engine components) and wing structures. The company's major projects are under way in Wichita, Kan., and in Kinston, N.C. Together they represent an investment of more than US$830 million and have the potential to create more than 1,700 jobs. Both projects are the fruit of the labors of Spirit's global footprint team, which the company created in early 2007 to develop a plan to support its business growth. James Cocca, Spirit's director of facilities, says the global footprint team compiled a roster of potential expansion sites around the globe. groundbreaking ceremonies for Spirit AeroSystems' facility in Kinston, N.C.
Cocca says Spirit evaluates four primary factors when making site decisions such as those behind the Wichita and Kinston projects: location and logistics, work-force availability, startup and recurring costs and available incentives. Spirit is investing $260 million in the Wichita expansion over the next five years, which will create an estimated 700 jobs with a projected annual payroll of more than $42 million. The company will build a 375,000-sq.-ft. (34,837-sq.-m.) plant to handle the manufacturing and testing of the new Cessna Citation Columbus. The company will receive $14.5 million in state subsidies and $3.2 million in local incentives. Spirit will also receive a 10-year property tax abatement with an estimated value of $16.5 million. In the case of the Wichita project, the primary driver was proximity to Spirit's primary customer, Cessna. "Our metallic fuselage center of excellence is already here in Wichita," Cocca says. "We're building an aluminum fuselage for Cessna's new large business jet. Because of those two things, it made a lot of sense to expand at our current site. Incentives were an important factor, but in this case, they weren't the driver." Cessna is investing $780 million and plans to create approximately 1,000 jobs with the development of the Citation Columbus, its largest business jet. The new plant will be a stand-alone facility that will house engineering offices and final assembly of the jet. Cocca says the global footprint team assembled a list of 24 potential sites as part of a "tri-lateral" strategy to have manufacturing platforms in the Americas, Europe and Asia. The team pared the list to 10 sites based on proximity to Spirit's major customers. Spirit contracted with Haskell Construction for the design-build of the new Wichita facility, which is due to be completed by early 2010. Spirit will build a 500,000-sq.-ft. (46,450-sq.-m.) complex at the North Carolina Global TransPark (GTP) near Kinston to design and manufacture the center fuselage frame section for the Airbus A350 XWB (Xtra Wide-Body) commercial aircraft. The company also will produce the front spars for the aircraft's wings at the Kinston plant, which, like the Wichita facility, is scheduled to be operational in 2010. "One of the key drivers for the Kinston site was the product we will be building is an Airbus product," Cocca says. "The fuselage panels have to go to Europe for final assembly. So, the keys were location and logistics. We needed to be near a seaport. That's why the East Coast made a lot of sense." That seaport is the Port of Morehead City, one of the deepest ports on the U.S. East Coast. Spirit will link to the port via a 5.5-mile (8.9-km.) spur to be constructed from Norfolk Southern's line to the Global TransPark. That line is part of the GTP's master plan and has been on the drawing board for years. The N.C. DOT expects to select a route by the end of the year for the spur, which will take two to three years to build, Cocca says. Spirit will ship components from Morehead City to Airbus facilities in France. The tipping point came in the form of North Carolina's incentives package, valued at more than $200 million over 20 years. "What really put us over the top in North Carolina, and in Kinston, was the economic development package," Cocca says. "The Global TransPark has been looking for a major tenant and has been at the altar a few times. They have been looking to land an aerospace company. Spirit will bring good jobs to the area. Just our presence over a seven to 10-year period will generate $2 billion [in economic activity]. Jobs created by our suppliers will be on top of that." North Carolina's Golden LEAF Foundation is providing a $100-million grant to the GTP Authority to construct the initial buildings for Spirit. The company plans to invest an additional $100 million to build other facilities in phases over the next six years. Spirit has held preliminary discussions with suppliers about locating in the area. Cocca says they represent "a long-range possibility" which could substantially augment the number of jobs Spirit plans to create. Spirit will hire approximately 500 people for its two scopes of work at Kinston, plus a small design center. That number may rise to approximately 1,000 over seven years. The promise of more than 1,000 jobs is welcome in Kinston and Lenoir County, which have been hit hard by textile plant closings in recent years. "We did an in-depth labor study of a 50-mile (80-km.) radius from Kinston, including 13 counties, and found a highly skilled, underemployed work force, much of it coming from the textile and furniture industries," Cocca says. Manufacturing in Kinston will involve composites which are manufactured through textile processes. The textile manufacturing skill set available in the region will translate well for Spirit's plans, which include eventual development of a composites center of excellence. "I was part of a team that spent a full day on the N.C. State campus talking about the future of composites and how we can collaborate with them," Cocca says. 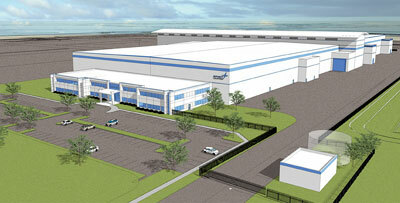 Spirit AeroSystems' Kinston facility, shown in rendering, is due to open in 2010. "We had our engineering development and manufacturing people there. There is not a formal arrangement yet, but we saw it as a real positive having the capability there, and we certainly hope to take advantage of it." "From my standpoint as facility director for Spirit and heading up this global footprint team, the day we received the award from Airbus was the day we announced we would be building that product in Kinston. That's the proactivity we are looking for, to be ready with sites." Spirit's potential site list now features about eight active sites around the globe, including the company's current manufacturing sites. Spirit is working with area community colleges to develop its work force, and will utilize a training center at the Global TransPark. "Advanced composites technology is unique, and although it has been around for more than 20 years, it is being applied in different ways than in the past. It will be critical to our success." The growing shortage of aerospace engineers factors into every site decision, Cocca says. "It's a real concern. It's a pacing item and something we have to think about. There is a severe shortage, especially for mechanical stress engineers." Spirit announced a joint venture in 2007 with Progresstech, a Moscow-based engineering services firm, to increase its pool of experienced engineers. The Russian engineers will be working on the Cessna project. "With the new Kinston location, we are going to start out with a small engineering center as we ramp up manufacturing," Cocca says. "It will be an opportunity to attract some engineers." Wichita, with its bevy of aerospace companies, has a shallow labor pool, Cocca says, requiring that Spirit make a considerable investment in training of new employees. "It's generally known in the state of Kansas, and in Wichita, that we need to attract more workers." Cocca says the National Center for Aviation Training, a $54-million project under construction on the grounds of Jabara Airport in Wichita, will provide help when it opens in about two years. Cessna is investing $780 million to produce its large business jet, the Citation Columbus. Wichita Area Technical College will serve as managing partner and will coordinate course offerings. Spirit plans to open a composites assembly center of excellence near Kuala Lumpur, Malaysia, in January. Cocca says the facility will support Spirit's European operations, based in Prestwick, Scotland, but eventually could support possible future Asian expansions. Spirit will invest about $20 million at the site, which will eventually employ 300 to 500. The initial 242,000-sq.-ft. (22,481-sq.-m.) facility, Spirit's first manufacturing site in Asia, will be fully operational in the first quarter of 2009 and will be located in the Malaysia International Aerospace Centre at Subang. At the outset, it will produce a variety of composite subassemblies, but will have growth capacity for new products and services. Prestwick is also the site of expansion, with the formal opening in September of a new maintenance, repair and overhaul repair station. The facility will support customers in Europe, Africa and the Middle East. The new facility, which has received its European Aviation Safety Agency (EASA) Certification, will perform composite repairs and overhauls. The initial scope of work is focused on engine nacelles and components for Boeing 737NG and 777 aircraft. Honeywell Aerospace's annual Business Aviation Outlook, released in October, forecasts delivery of approximately 17,000 new business aircraft from 2008 through 2018, generating expected industry sales of $300 billion. 2008 marks the fifth consecutive year of industry expansion since the last industry slowdown in 2003. For 2008, Honeywell Aerospace forecasts deliveries of nearly 1,200 new business jets for the first time in history, up from 1,020 in 2007 – a 15-percent increase, despite an uncertain economy in North America. Deliveries in 2009 are expected to range between 1,300 and 1,400 jets, depending on how quickly several new programs are able to ramp up. Honeywell's survey indicates record aircraft deliveries will continue into 2009, with a likely peak next year or in 2010. North American purchase expectations improved slightly, but expectations in several other world regions softened to some extent. In total, respondents to this year's survey said they expect to replace or expand the equivalent of about 32 percent of their fleets over the next five years, within one percent of the level recorded in the 2007 survey. Figures compiled by the General Aviation Manufacturers Association during the first half of 2008 also point to increased sales in the business jet and turboprop segments. Turboprop shipments increased from 186 units in the first half last year to 222 units in 2008. Business jet shipments totaled 663 units in the first half of 2008, a 39.3-percent increase over the 476 units delivered in the second quarter of 2007. Barnes Aerospace, a business unit of Barnes Group Inc. and a global jet engine component overhaul and repair service company, has tripled the size of its operation in Utah, unveiling a new 165,000-sq.-ft. (15,329-sq.-m.) facility in Ogden. The new plant, located in Business Depot Ogden (BDO), provides opportunities for the division's continued expansion and meets growing customer demands for the new generation of fuel-efficient transportation, such as the Boeing 787 Dreamliner. "Barnes Aerospace's Ogden Division is a pioneer in superplastic forming technology," said Brent Wiberg, vice president and general manager, manufacturing, Barnes Aerospace, in late September. 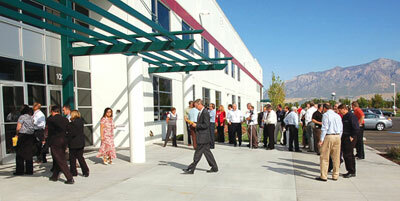 Barnes Aerospace held grand opening ceremonies in late September at its new facility in Ogden, Utah. "We have continued to build on this reputation over the last few years with significant investment in new equipment. This new equipment, paired with customer demand, has made it necessary for us to expand our operations in Ogden, where we have done business for the last two decades." Wiberg said the Ogden division has seen its annual revenue triple over the last 10 years, and he credits Utah's pro-business environment and dedicated work force for much of its success. "We empower our employees to leverage their creativity, talent and commitment to excellence, to perform at their best and improve our customers' performance," said Barnes Group President and CEO Gregory F. Milzcik. "Utah has provided us a conducive backdrop to execute on this mission, offering a robust pool of talented employees and a healthy business climate. Active communities that deliver the right work and life balance are a hallmark of employee retention, and we look forward to continuing to build on our success in the state." Barnes Aerospace's Ogden Division specializes in aerospace sheet metal fabrication and complex assembly and is a leading producer of precision airframe and engine components and assemblies serving aircraft and engine manufacturers on a global scale. The facility is a prime source for complex fabrication of high-temperature metals, including titanium, hasteloy, inconel and stainless steels. Barnes Aerospace produces precision machined and fabricated components and assemblies for original equipment manufacturer (OEM) turbine, airframe and industrial gas turbine builders throughout the world. Barnes Aerospace also provides jet engine component overhaul and repair services for many of the world's commercial airlines and military applications. Aircraft service provider Duncan Aviation announced plans to build its third full-service maintenance facility for business jet aircraft in Provo by August 2010. The facility will provide airframe, engine, interior completions, exterior paint and avionics installation services for business aircraft from around the world. "Nearly two years ago, driven mostly by customer demand, we started looking at potential service center sites in the western United States," said Todd Duncan, chairman of Duncan Aviation, in early October. "Our site selection criteria were based on our other successful models, and we are excited to have found Provo, a community very similar to those surrounding our Lincoln, Neb., and Battle Creek, Mich., locations. "Now that the Utah state incentives are finalized, we will commit to building the facility at the Provo Municipal Airport," he said. 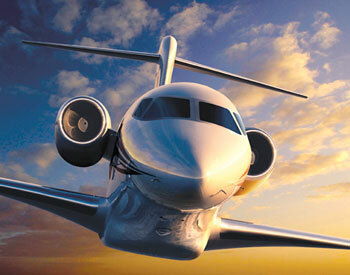 "The planned facility and its location have been enthusiastically received by several business aircraft manufacturers. 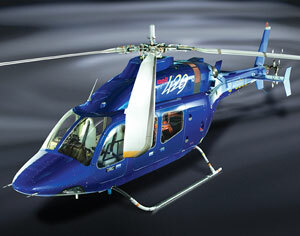 Textron's new plant in Chihuahua, Mexico, will manufacture parts for its Bell 429 commercial helicopter. Several OEMs have committed to provide Duncan Aviation-Provo with service center authorizations upon the facility's opening. We look forward to continuing to serve business aircraft operators with this westward expansion." Mexico continues to draw investment from U.S.-based manufacturers. Textron, the parent company of iconic aerospace names such as Bell Helicopter and Cessna, announced in September that it will expand its operations in Mexico after reaching an agreement with the State of Chihuahua to build a new factory which will operate as Textron International Mexico. The new facility, which will eventually employ about 375, will be used to manufacture various minor assemblies, structural elements and wire bundles for the Bell 429 commercial helicopter. Once work is completed in Mexico, the parts will be shipped to Textron's Canadian helicopter manufacturing operation for final assembly. This expansion broadens Textron's global footprint while enhancing Chihuahua's growing regional aerospace hub. "Chihuahua offers Textron an outstanding industrial environment in which to do business," said Siisi Adu-Gyamfi, senior vice president, international and marketing. "We continue to be impressed with its talented labor force, as well as its strategic northern Mexico location."